Paul Cook has once again bemoaned the ‘frightening’ level of pressure that football managers are subjected to. 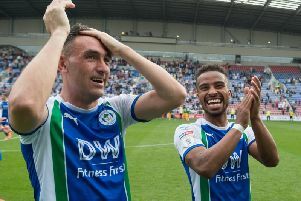 Wigan Athletic entertain Stoke City on Wednesday night at the DW Stadium, looking to record a first ‘double’ of the campaign, having won 3-0 in the Potteries last August. Stoke have changed their manager since then, with Nathan Jones having taken over from the sacked Gary Rowett. Jones, who was rewarded for working wonder on a shoestring budget at Luton, has had a tough start at Stoke, who have lost four of their five league matches under his stewardship, as well as crashing out of the FA Cup to League One Shrewsbury. But Cook laughs off the notion now is a good time to be playing a club who were the pre-season favourites to win promotion back to the Premier League. “They’ve struggled haven’t they...he’s had all of five games, has Nathan!” Cook said. “That’s how bad football is these days, that’s how mad it is. “To go into a club that was relegated from the Premier League last year, in a transition period, and get five matches before people are asking questions. implement new philosophies, new styles of play, educate the players...it’s frightening the way the game’s going. “I’m sure the players will eventually evolve into what Nathan wants. “But it’s going to take more than three or four games to do that! “Unfortunately, it’s something that us managers can’t stop. “Hopefully one day soon the game will try and restore some sanity, and stop bringing such pressure to the manager’s door.